Here at Adexcel Aesthetics Clinic, we understand that sometimes life gets in the way and we can’t always keep to appointments booked for a variety of reasons. We have written this cancellation policy to give you further information about the terms under which you may be able to cancel a booked appointment. This enables us to offer you and all our other clients the best possible service we can. For the purposes of this website, “we”, “our”, or “us” refers to Adexcel Aesthetics Clinic. 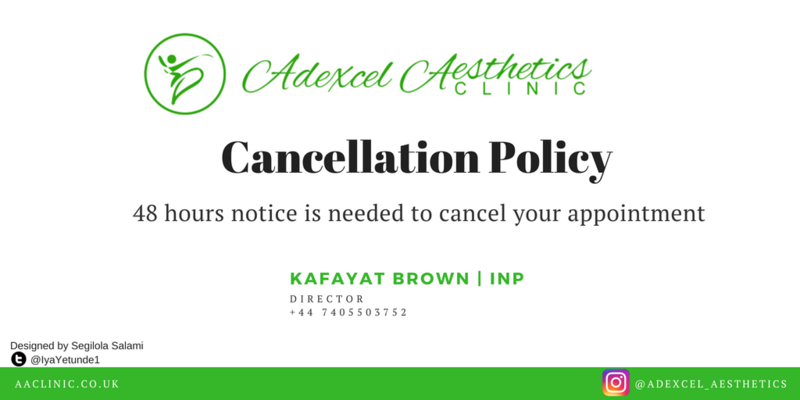 Adexcel Aesthetics Clinic operates a 48-hour cancellation policy. What this means is that should you wish to cancel or rearrange your appointment(s), you need to give us at least 48 hours’ notice. You will be charged the full cost of your appointment if you do not turn up at the time booked for your appointment or if you do not give us adequate notice to cancel or reschedule the appointment. At our discretion only, we may be able to consider rescheduling your appointment at no extra cost to you if there was a genuine emergency. For instance, if there was a medical emergency and you needed to attend the Emergency Department. Please click here to see our contact details. Should you need to cancel or reschedule your appointment, please call our clinic on +44 074 0550 3752 and speak to a member of our team. As we are open 6 days a week, we are optimistic we would have a slot available to suit your needs. The full price for courses of treatment are non-refundable should you wish to cancel your appointment(s) part way through a course. However, the remaining balances for outstanding treatments can be transferred to alternative treatments provided by us if you no longer wish to continue a particular course of treatment. Please speak to your treatment consultant for further details. Where it is necessary to do so, we may recommend a change in your treatment programme during your course of treatment to meet your individual needs.